"One of the best and truest testimonies of personal experiences in battle I have read." 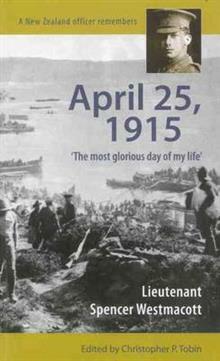 - Major-General Sir Howard Kippenberger With the 100th anniversary of the famous landing at Anzac on April 25, 1915, approaching this book provides a brilliant insight into what happened th... read full description below. "One of the best and truest testimonies of personal experiences in battle I have read." With the 100th anniversary of the famous landing at Anzac on April 25, 1915, approaching this book provides a brilliant insight into what happened that day through the eyes of a New Zealand officer who was ACTUALLY THERE - Lieutenant Spencer Westmacott, of the Auckland Infantry Battalion. Spencer Westmacott, like many of his generation, grew up enthralled by military history. He sought out veterans to learn of their experiences in battle and when war came in 1914 he volunteered enthusiastically. The book follows his path to war providing fascinating insights into his fellow soldiers - the original Anzacs. Who were they? Why did they go so willingly to war? How did they end up fighting Turks when it was expected they would fight in France? Were there tensions among them? What were the soldiers' feelings on the eve of their first battle? How did they react when under hostile fire for the first time? All of these questions are answered by Lieutenant Westmacott in a way which humanizes the Anzac story magnificently and gives us a wonderful understanding of just what it was like to go to war in 1915. Lieutenant Westmacott was seriously wounded on April 25, 1915, and had a desperate fight to live. Many of his friends were killed; militarily speaking the landing failed and yet, incredibly, he called this day of horror "the most glorious day of my life." Why? We must read his story to find out. Richly illustrated and superbly annotated by Christopher Tobin, this book is essential reading for every New Zealander, and especially students wishing to deepen their knowledge of the day which shaped New Zealand history. The book is also suitable for year 11 to year 13 students and I believe it would interest schools given that the centenary of the Anzac landing is approaching. Christopher Tobin is editor of the Oamaru Mail daily newspaper. He has written several books, one of them 'Gone to Gallipoli: Anzacs of small town New Zealand go to war.' His interest in the Anzacs grew after he learned three of his great uncles served together at Gallipoli, one of them being killed in action there aged 20.